When Ayman Souabny looked around his school and his city, he didn’t see much of anything but concrete. City Manager Tom Ambrosino, Council President Damali Vidot and Supt. Mary Bourque join Wright Middle students Luis Cruz-Martinez,Ayman Souabny, Sherlyn Melgar and Kevin Mizhquiri in front of the school last Friday, Oct. 19, to celebrate Arbor Day by planting a tree in front of the school. The planting was a request made by the students, fulfilled by local government. He, and many of his students at the Wright Middle School, wanted to see trees. And the City heard their call. 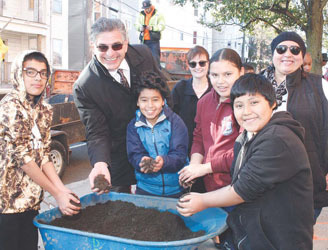 On Friday, the Chelsea Tree Board and City officials joined Souabny and several other key students who called for more trees around the Williams School building to plant a ceremonial tree in honor of Arbor Day. Tree Board member Julie Shannon said it’s a small gesture, but it’s one that – on Arbor Day – the students will be able to remember for a long time. City Manager Tom Ambrosino said the new trees will be something students can remember for a long time. Council President Damali Vidot said many of the comments she gets from students are about the environment. Principal Michelle Martiniello said she was proud of the students for getting such a thing done. “A lot of the time we encourage them to get involved in the community, and this time, it showed great benefits,” she said.